산조란 장구반주에 맞추어 다른 악기를 독주형태로 연주하는 것을 말하며, 4∼6개의 악장을 구분하여 느린 장단에서 빠른 장단 순서로 연주한다. 가야금으로 연주하는 산조를 가야금산조라 하고, 직접 가야금을 타면서 노래부르는 것을 가야금병창이라 한다. 모든 산조는 느린 장단으로 시작하여 차츰 빠른 장단으로 바뀌는데, 이는 듣는 사람을 서서히 긴장시키며 흥겨움을 끌어올리게 한다. 가야금산조는 4∼6개의 장단으로 짜여지는데, 진양조는 아주 느리고 서정적이며 중모리는 안정적이다. 중중모리는 흥취를 돋우며, 자진모리는 밝고 경쾌하다. 휘모리는 흥분과 급박감이 있다. 다른 악기의 산조에 비해 가야금산조는 가야금의 악기적인 특성으로 인해 여러 명인들이 다양한 음악유파를 형성할 수 있었다. 가야금병창은 단가나 판소리 중 한 대목을 따다가 가야금반주를 얹어 부른다. 가야금병창은 원래 가야금산조의 명인들이 불렀지만, 오늘날에는 산조와 병창의 연주자가 분리되는 추세이다. 원곡이 따로 있는 노래를 병창으로 부를 때에는 가야금 특유의 선율로 인해 본래의 곡과 다른 맛이 나고 독특한 개성을 표현하게 된다. 판소리 흥보가 중 “제비노정기”, 춘향가 중 “사랑가”, 수궁가 중 “고고천변”, 심청가 중 “심봉사 황성가는 대목”은 가야금병창의 유명한 대목이다. Sanjo refers to the playing of an instrument solo to the accompaniment of janggo (hourglass-shaped drum), moving from slow to fast rhythm, in four to six movements. 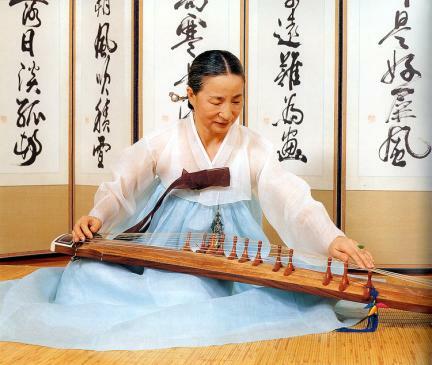 Gayageum Sanjo is Korean instrumental folk music played solo with gayageum (twelve-stringed zither). 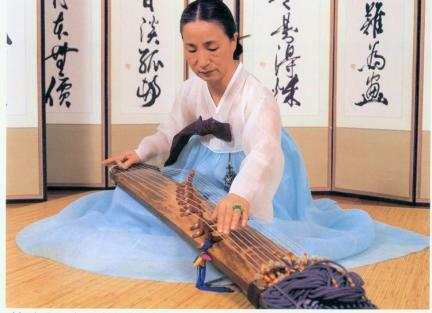 Gayageum Byeongchang refers to the singing and playing of gayageum at the same time. All Sanjo start with slow rhythm and gradually changes to faster rhythm, making listeners feel tense and increasingly delighted. 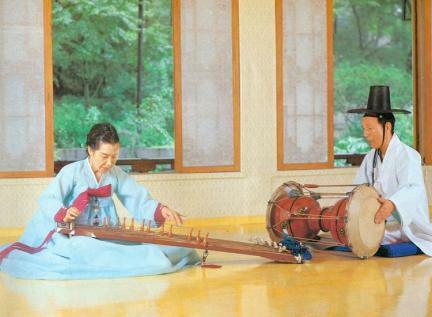 Gayamgeum Sanjo is made up of four to six rhythms: jinyangjo (slow), jungmori (moderate), jungjungmori (moderately fast), jajinmori (fast), and hwimori (fastest). Compared to other instrument-based Sanjo, Gayageum Sanjo masters could form diverse schools thanks to the unique characteristics of gayageum. 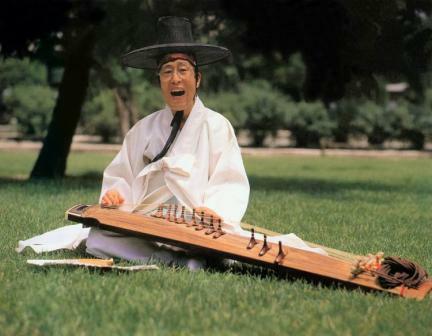 A singer engaging in Gayageum Byeongchang sings a part of danga or pansori to the accompaniment of his/her own gayageum playing. Gayageum Byeongchang used to be sung by Gayageum Sanjo masters, but the current tendency is for the separation between players of Sanjo and Byeongchang. 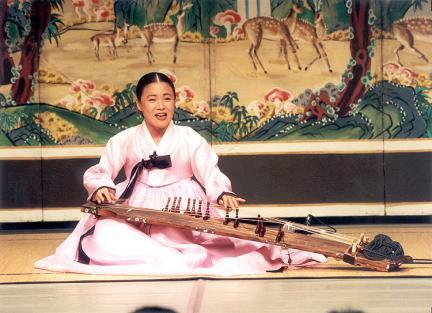 A song sung as Byeongchang creates its own atmosphere due to the unique melody of gayageum. 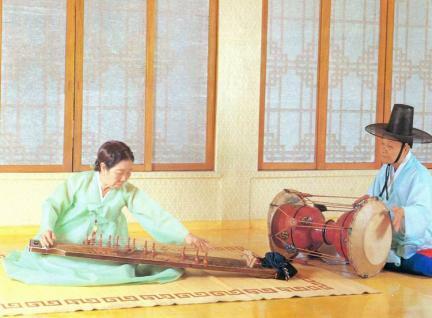 The following are well-known parts of Gayageum Byeongchang: Jebinojeonggi (Route of the Swallow's Trip) of Pansori Heungboga (Song of Heungbo), Sarangga (Song of Love) of Chunhyangga (Song of Chunhyang), Gogocheonbyeon (Brightness of the Sunshine in the Sky) of Sugungga (Song of the Rabbit and the Turtle), and “Sim Cheong’s Father on His Way to Hwangseong” of Simcheongga (Song of Sim Cheong).